Lasagna is a comfort food. A dish that we never get complaints about because while I remember it having cooked spinach which I used to despise, all the ingredients blend together into one brilliant mouthful. However, the cheese is a big selling point and some of us have been known to add extra and if you’re not paying attention they may sprinkle way more parmesan than you had expected. Not to leave out, the extra sprinkling of cheese when it is on their plate. However, this does not mean us normal non-cheese obsessed people won’t enjoy a white lasagna. Some of us can’t eat tomatoes in large quantities, and perhaps the disappointment wears you down until you come up with an epically good lasagna that everyone in the family will enjoy. 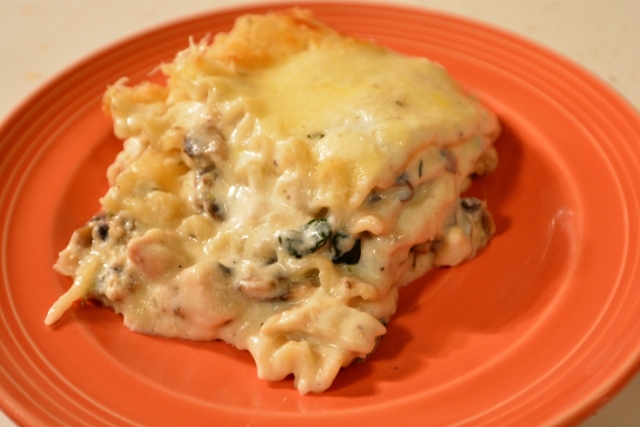 To the point where red lasagna is a sad memory in comparison to the splendor of this Lemony Chicken Mushroom Lasagna. The lemon zest was a total afterthought, but it tied the entire dish together. Don’t skimp on it as we used an entire lemon for our zest. So, this dish was beyond loved. Someone even marked the leftovers. Even though I’m fairly certain that even that wasn’t enough to deter lasagna lovers. Truly, this is a hearty dish although, we do recommend having side dishes. You’re not going to want to share all this lasagna with your family. I mean, they probably, just a guess, didn’t even help you cook it! Who are they to deserve the Italian goodness that oozes love onto a plate! They don’t appreciate the flavors and perfectly layered ingredients. Heck, can they even spell béchamel? This may be a dish where you realize who your favorites really are. Luckily, Seven is the favorite, but he can’t eat garlic so more lasagna for me! 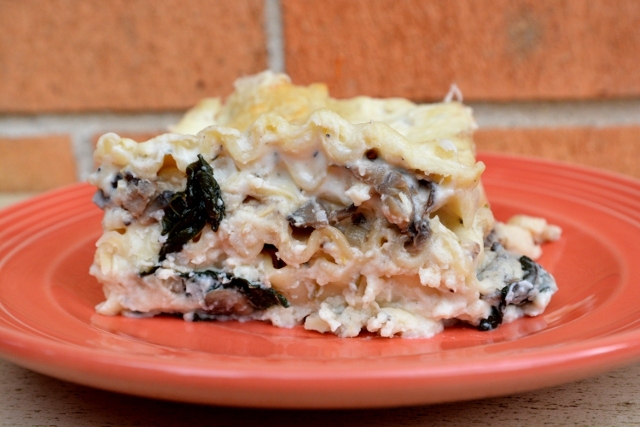 A white lasagna with chicken, mushrooms and the kicker of lemon zest. A winning combination of spices that will have you question red lasagna. Preheat oven to 350 degrees and grease a 9 x 13 inch baking pan. Set aside. Bring a large pot of water to a boil and cook lasagna noodles til al dente per package instructions. I always cook a few extra in case some break. Drain and set aside till ready to assemble lasagna. In a large non-stick skillet heat 1 tablespoon olive oil and cook chicken until browned, 5-6 minutes. Remove from skillet and place in heat proof bowl. In same skillet, heat other tablespoon of olive oil and add onions, cook until they soften 3-4 minutes. Add garlic and cook 30 seconds until fragrant. Add mushrooms and cook until their liquid releases and evaporates. Add spinach and cook until wilted, add wine and cook until wine evaporates. Remove from pan and mix with chicken. Set aside. In a medium saucepan, melt 4 tablespoons unsalted butter. When melted, whisk in 1/4 cup flour and cook until its a thick paste (about a minute). Slowly whisk in 3 cups of milk and then heat until mixture thicken, whisking occasionally to keep mixture from scalding/burning. When mixture thickens, add rest of spices and remove from heat. In either a food processor or blender, process cottage cheese until its incredibly smooth. Place in bowl and combine with mozzarella, parmesan, lemon zest and salt and pepper. Now its time to assemble the lasagna!! In the greased 9x13-inch baking pan, pour a 1/2 cup of the bechamel sauce in the bottom and spread it around. Layer 3 noodles across the bechamel sauce, then 1/3 of the the chicken/mushroom mixture, 1/3 of cheese mixture and a light covering of bechamel. Repeat for 2 more layers of noodles. Top last layer with noodles, spread with remaining bechamel sauce and sprinkle with 1/2 cup mozzarella cheese and 1/4 cup grated parmesan. 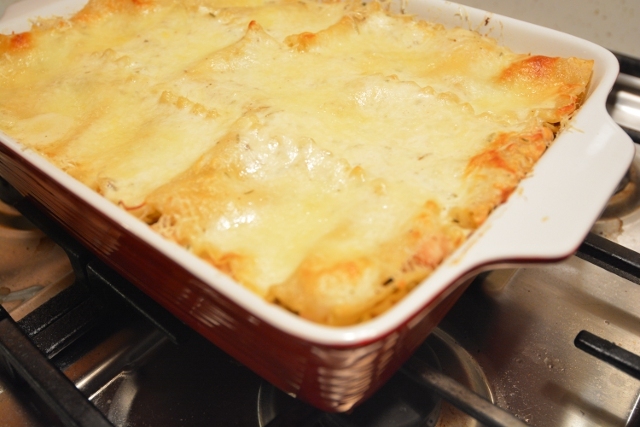 Bake in oven at 350 degrees for 30-35 minutes or until lasagna is bubbly around the edges. Let cool five minutes before serving.